I used to think I knew. At least I thought I had an idea. Over time Thai massage has vaporized in my mind in the way that American history has changed due to revisionist history. When I first studied with my teacher it was just Thai massage sometimes called Thai yoga massage and the yoga was just to let people know it was something like yoga where you stretched the client. At that time that was enough. My interest in the practice was immediate and I felt a deep longing to travel to Thailand and study more in time. Due to life, finances and work I continued using what I’d been taught over the years and noticed my confusion as to why massage therapists worked as they did. Mat work was easier on my body more pain relieving and effective for clients but I couldn’t for the life of me find work in Austin, Texas. Austin being a progressive hub I was quite confused at the lack of diversity in the bodywork marketplace. Swedish and deep tissue ruled the landscape. In places I interviewed for work they made it very clear that they have no idea what Thai massage was and wouldn’t be offering something consumers weren’t asking for. In my search for information I could find schools in the U.S. but they didn’t seem to be talking. It was as if they existed in isolation. I did what I always do. I got up and went. I started the US Thai massage group on facebook and brought many of the prominent teachers to myself. Immediately they began arguing with each other and even moreso subtly announcing that I didn’t know anything. This westerner was teaching Thai massage having never been to Thailand. 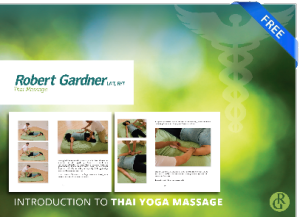 I produced a free Thai massage workbook that I gave away on my website. I was criticized even more for polluting a sacred tradition with my theoretically errant writings. I’d never presumed to know everything. I just presumed to know more than the students I was teaching. Most of them were completely floored by what I was sharing as it was nothing like anything they’d been taught before. They did massage on a table with the client under a sheet and blanket using oil or cream on bare skin. I was working on clothed clients on a mat using things that looked more like Brazilian jiu jitsu than massage. I had full use of my whole body including legs and feet. Six years in teaching later I still don’t know what Thai massage is. I teach something called Thai massage but that label only seems to work for people if they’re not interested in lineage. I read articles. I follow the traditionalist camps and listen to their rally cry of tradition and lineage but deep down it doesn’t resonate for me at all. I was never really interested in Thai massage in that way. I was interested in helping people overcome pain. Thai massage was just the vehicle to help them there. What is Thai massage is still the most searched for keyword term for Thai massage via google. No one knows what it is. Increasingly what I notice is there’s someone as white and as western as I am smiling and telling you he can teach you the Thai secrets for a large sum of money. What is Thai massage? I’m not really certain but I enjoy a good debate and find people fun to watch. At this stage in my career I’ve written eight hundred pages of some of the most detailed sequence manuals on Thai massage in the western marketplace. I’m biased of course but my materials were writtien with massage therapists in mind. I was helping them transition from the table to the mat, no small undertaking for a table based culture. Saying I don’t know what Thai massage is means I wrote eight hundred pages of what exactly? My soul. Mostly that’s what’s on those pages. My toil and care for others over the last thirteen or so years is on display. Much like youtube video comments people will have much to say about my being fat. I’ll be told what I do isn’t Thai enough. It’s not this enough or that enough and doesn’t include prayers to Jivaka and the Buddha. If you’ve a keen eye you’ll take something out of context and tell me I’m off hara and not moving correctly. You’ll announce I’m doing it wrong. At this stage I’ll just sit back drink some scotch ponder my age increasing belly fat and laugh. Frankly, I don’t care much about tradition. I’m a Scots-Irish born man from south Louisiana. My people are the ones you saw during hurricane Katrina on tv and in protests over Alton Sterling in my hometown of Baton Rouge, La. Critics? Oh I’ve got plenty of those. I’ll continue to have them as long as I live. What is Thai massage? I’m still not certain. When you dig enough the pieces start to fall apart. Is it Thai? Is it ancient? Is it sacred? Is it for sale? Your Thai massage is what you make it. Don’t let anyone criticize your practice. We all have opinions. My question to you is what you are doing helping others? Then keep going. Do you ask good questions and self reflect? Then keep going. I’m not as interested in Thai massage as I am in how you treat your neighbors. I help mine. Do you? Is that Thai massage? 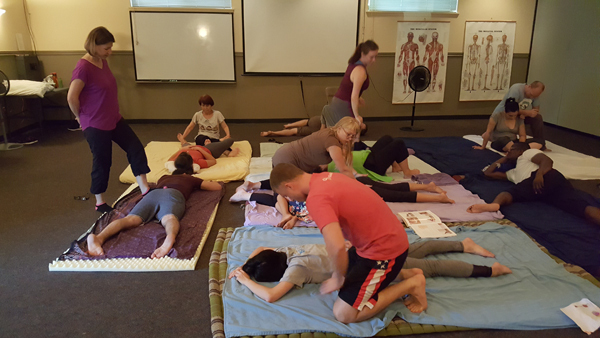 What is Thai massage jam ®? Sciatica Pain?